As the final season of Game of Thrones approaches, HBO is releasing more merchandise to promote the epic saga. 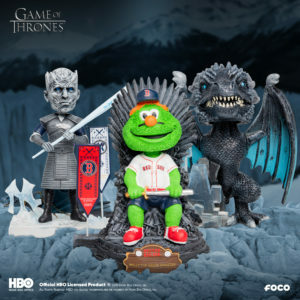 Entertainment manufacturer FOCO has just introduced its newest bobblehead series featuring a collaboration between the worlds of Major League Baseball and Game of Thrones, according to an article by the Hollywood Reporter. It’s a unique combination of two different worlds but this only reflects the extreme popularity of the fantasy series. “The first series includes three distinct bobblehead styles merging the two worlds and features: The Iron Throne, the Ice Dragon, and the Night King.